Greenlandic whalers hunt with a quota given by the International Whaling Commission (IWC) for ‘Aboriginal Subsistence Whaling’ (ASW). This is supposed to supply Greenlanders with a nutritional and cultural ‘need’ to hunt. But the lines between commercial and ASW hunting are being blurred and the meat is being sold to tourists. In 2016 Greenland killed a total of 162 large whales: 148 minke whales, 9 fin whales and 5 humpbacks. Greenland’s whalers claim they hunt for cultural and nutritional needs – but WDC has proved it is also being sold to tourists. Whale meat from the hunts has been sold in Denmark, illegally. Despite the the fact that not even all whales from a quota are currently taken, the Greenlandic govt. has repeatedly asked for a bigger quota of whales to kill. Greenland is targeting tourists to buy whale meat. This contravenes the IWC rules and cannot be justified as ‘subsistence’ whaling. Official marketing for visitors to Greenland actively promotes whale meat as a local delicacy. In August and September 2014, WDC carried out investigations into the sale of whale meat and products to tourists in Greenland. We found meat from four species, minke, fin, narwhal, and the most widespread, humpback whale, on sale to both local Inuit and to tourists. Blue whales, sei and sperm whales featured in a lexicon of whale species (in English, as well as Kalaallisut and Danish) displayed in above the chill cabinets in the braettet (fish market) on the capital’s main street. 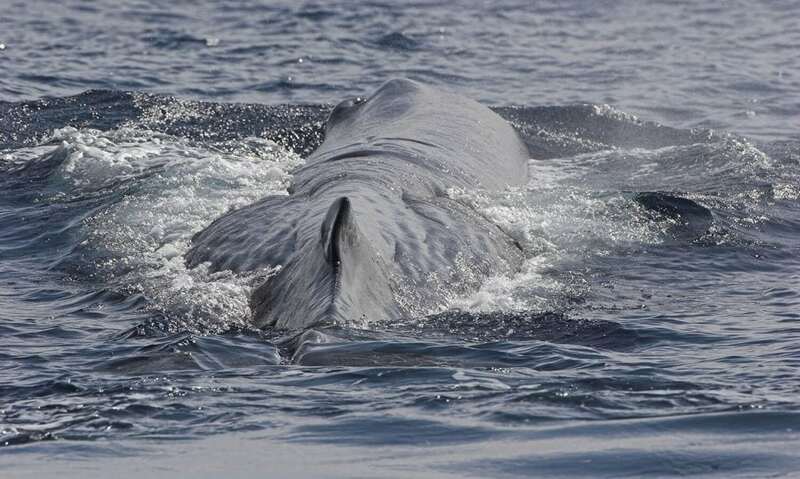 Promotional material written in English targeting tourists with offers of blue, sei and sperm whales, all of which are supposed to be protected species. The Braettet (fish market) had freshly killed minke whale (with pectoral fin) on sale, again, also available to tourists. Humpback whale meat on sale at the Pisiffik supermarket, again freely available to tourists. Café Inuit had whale meat on the menu. Café Hong Kong (takeaway) offered a whale curry. The World of Greenland Visitor Centre offered narwhal, beluga, orca and other whale artefacts. Ice Cap Tours (offering boat trips and other tourist excursions) offered a similar range of whale artefacts. Humpback whale meat (Pukkelhval) and minke whale meat and blubber on sale in Pilersuisoq, a large, modern, well-stocked supermarket, where it is also available to tourists. Narwhal jewellery and orca tooth necklace on sale in various outlets, but no obvious mention anywhere of export requirements under Convention in Trade in Endangered Species. This investigation was made possible by the support of the SEA LIFE Trust. Greenland is an amazing and beautiful country to visit. Tourists are targeted with whale meat and other products. Please don't support this industry. We have produced a list of items you might see on menus in restaurants and other products derived from whales. As well as reporting on whale for sale in Greenland, WDC has documented illegal sale of whale meat caught in Greenland to tourists in Copenhagen, Denmark, leading to an EU investigation of this abuse of IWC regulations. WDC is concerned that increasingly, market forces appear to be driving whaling activities. Greenland admits that distribution companies are involved, but often fails to note that some of these are profit making, and others are part owned by the Greenlandic Government. Greenland is trying to force the IWC to accept that the whole of Greenland should be considered 'local,', enabling it to sell whale meat to tourists and non-Inuits alike despite the fact that it previously made a claim that it was for subsistence hunters only. In 1989 Greenland claimed, ‘it is safe to conclude that the need for meat which existed at the start of the century has remained constant’. Denmark made a claim based on the need of 13,797 hunters.. Today this number has dropped to 5305 (in 2012) inclusive of sports licences. In the last twenty years, the Greenlandic Government has shifted its stance to claim that whaling is part of a total Food Security policy of meat supply rather than meeting the needs of pure subsistence. The Greenland Government noted during the 2008 IWC meeting that ‘in the definition [of ASW], the terms ‘local community’ and ‘predominant portion’ are not defined. Denmark regularly asserts that the whole of Greenland is ‘a local community’ Its logical conclusion is that ‘all’ citizens of Greenland should be included when calculating whale quotas. But despite a falling population, Greenland has repeatedly demanded an increased quota of whales. Whilst the IWC has historically viewed ASW communities as ‘minorities’ Greenland seeks to define itself as an ‘ASW nation’. WDC believes this definition is too open ended. We believe Greenland should seek to meet only the needs of those native peoples who have a nutritional reliance on whale meat, not those who would like to make money out of whaling.